Melbourne residents are protesting Apple's plans to build a Foster + Partners-designed flagship store in Federation Square. Almost 45,000 protestors – up 5,000 in the last 24 hours – have signed a petition against the demolition of the Yarra Building, which will be replaced by the Apple Store. Signatories of the Hey Apple, hands off Fed Square! petition are also protesting the arrival of the store, which they believe will "irrevocably" alter the character of the square from cultural to retail, despite its Civic and Cultural Charter. The two-storey Apple Store will replace an existing three-storey building in Federation Square, a publicly owned plaza set on the bank of the Yarra River in the city's Central Business District. Apple's plans were made exempt from public consultation by the government minister for planning, Richard Wynne, due to the "wide-ranging social and economic benefits for Victoria". A move that has seen the Victorian government criticised, with campaign group Citizens of Melbourne against Apple Federation Square referring to the government's deal with Apple as "shady". On 20 December 2017, the Labor Victorian Government and Apple announced plans to demolish Yarra Building at Federation Square and replace it with an Apple retail chain store drawn by Foster + Partners. Victorian Government has refused to reveal all terms of this very shady plan. "The plans for Apple's incursion into Melbourne's cultural heart mirrors the insidious creep of commerce into pseudo-public spaces all over the world," wrote Melbourne-based writer James Norman in an opinion piece for The Guardian newspaper. 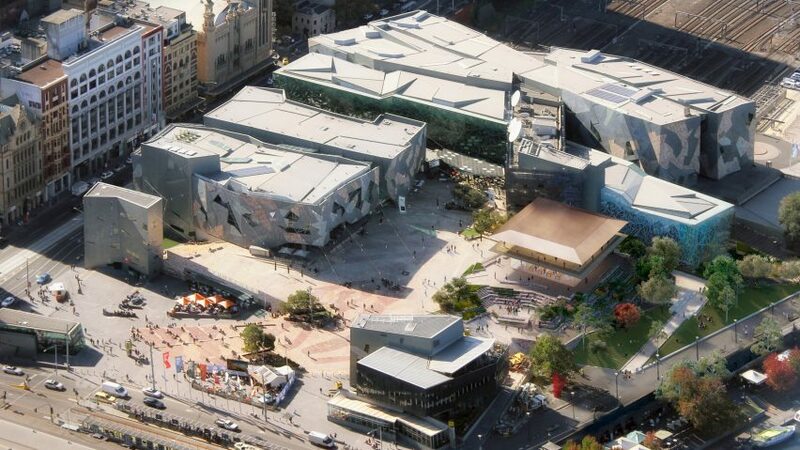 A statement on the Federation Square website counters the argument, and defends the plans passed by the Andrews Labor Government, which are predicted to draw two million visitors each year. "Federation Square operates on a commercial model, and there are already a number of commercial organisations operating in the space," it reads. "All new commercial operations in Fed Square need to enhance the cultural life and amenity of the square and Apple's proposal has aligned with this." Laura Murray of the Planning Institute Australia, Adrian Gray of the Australian Institute of Landscape Architects and Vanessa Bird of the Australian Institute of Architects have also penned a joint letter to Wynne, calling out the lack of public consultation. "In response to your recent approval, we jointly write to voice our concern over the lack of a clear and transparent planning process with no opportunity for community consultation for such a significant development in Melbourne's most iconic public square," they said. "Collectively, we advocate for the de-politicisation of the planning process and such a decision will only set a precedent for poor planning decisions in the future," the letter continues. "We believe that such a significant proposal for this publicly owned civic space should have gone through a transparent competitive process to ensure the most suitable tenants were selected." Lab Architecture Studio, Karres en Brands Landscape Architects and Bates Smart won a competition to design Federation Square Melbourne's first public plaza back in 1997, and work was completed in 2002. The 38,000-square-metre site stands on a deck on top of a railway line and is surrounded by buildings with fragmented facades made from zinc, sandstone and glass. The Ian Potter Centre for Australian art occupies one building, while the Alfred Deakin Building hosts the Australian Centre for the Moving Image. Work on the new Apple Store is expected to begin in mid 2019 and complete by 2020.